1965 was a watershed in Indo-Pak history! The war instead of being dispassionately analysed became a ground to attack and condemn political opponents! Complete books were written out of sheer motivation based on pure and unadulterated venom! To date the trend continues at the cost of serious research and history writing! Most of these books were written by beneficiaries of the usurper Ayub or Bhutto haters! Men with a naive knowledge of military history made worse by a desire to settle personal scores! Jaundiced history of the worst kind! This article is an overall analysis of the 1965 war based on military facts rather than any motivation to settle political scores based on matters of ego rather than any serious objective considerations! It is hoped that after 36 years readers would be more interested in hard facts rather than pure and unadulterated polemics by men who did not know the division of battle “more than a spinster”! Indo-Pak border like the vast bulk of Shakargarh bulge were unmanned on the Indian side! Qualitatively Pakistan had a tangible superiority by virtue of possession of relatively superior tanks and artillery! The Centurion tank which was the backbone of Indian army was concentrated in the Indian Armoured division while the vast bulk of Indian infantry divisions were equipped with the obsolete Shermans! Even in quality of command there were serious drawbacks! The Indian 1 Corps had been just raised and the GOC of the Indian 1st Armoured Division was about to retire! Indian Mountain Divisions brought into the plains lacked sufficient antitank resources and were not in the ideal fighting condition. Some 38 plus Indian Infantry Battalions were absorbed by the blotting paper of Indian Army i.e a tract known as Kashmir! All these battalions were deployed north of Chenab River. Indian Army was in the process of expansion and the Indian Army had no strategic reserves in the Ravi-Sutlej Corridor against the Pakistani 1st Armoured Division. Setting aside the ethical dilemma whether war is the best instrument of policy to settle political disputes militarily 1965 was the ideal time for Pakistan to settle its political problems with India. This point was realized by some mid- ranking senior officers in the Pakistan Army which included the Pakistani DMO Gul Hassan, Major General Akhtar Hussain Malik and by some civilians like Foreign Minister Z.A Bhutto and Foreign Secretary Aziz Ahmad. On the other hand Musa the Pakistani C-in-C was opposed to war! This was not because Musa was a pacifist but because Musa lacked military competence and was enjoying his second four-year-term as C-in-C of the Pakistan Army! Ayub the military ruler was initially against any military adventure but revised his ideas after Pakistani military successes in Rann of Katch. At the strategic level the Pakistani plan was superior. Its initial thrust launched with an infantry division-tank brigade size force against Akhnur was enough to cause a crisis of strategic level in the Indian Army. The situation with Akhnur in Pakistani hands would have been disastrous for India. All the Indian plans to launch the 1 Corps against the MRL would have been thrown to winds and Indians would have spent the entire war redressing the imbalance caused due to loss of Akhnur! On the other hand the Pakistani thrust in Khem Karan would have bottled up three Indian Infantry divisions in the Beas-Ravi corridor and three Indian divisions would have been forced to surrender. 1965 could have then been a Pakistani strategic success rather than a tactical draw as it turned out to be. On the other hand the Pakistani 6 Armoured Division was well poised to deal with any Indian armoured thrust launched in the Ravi-Chenab corridor. It was in implementation rather than planning that the Pakistani GHQ and Ayub failed miserably at the strategic level. The reason was simple. Both Ayub and Musa lacked strategic insight! They lacked the resolution and strategic coup d oeil to conduct decisive warfare. Both were extremely defensive in their approach and saw war as reacting to enemy countermoves rather than making the enemy react to their moves. Thus Musa as late as 1983 naively claimed in his book “My Version” that the aim of Grand Slam was not to capture Akhnur but to merely threaten it. In other words Musa saw a move which had the potential to cause a severe strategic imbalance in the Indian High Command as a tactical move to relieve pressure on Muzaffarabad! Allah be praised! Even a foreigner saw the immense importance of capturing Akhnur. Thus the remarks of Marshall Chen Yi the Foreign Minister of China who was visiting Pakistan at the time of Grand Slam. Chen Yi thus “made a sharp cutting movement at the little finger; ‘knock them out at Akhnoor’.That will help the freedom fighters and also guarantee the security of East and West Pakistan. With the little finger gone, the whole hand becomes useless”!2 So thought a veteran of a many decade long civil war! This was Greek for a man who was elevated to the rank of Army Chief because of political considerations! This was Greek for a man accused of tactical timidity in Burma! The principal reason of failure of both the armies was “failure or inability to develop a doctrine of decisive warfare”. This was a colonial legacy. The Indian Army of pre-1947 was an internal security machine designed for defence while the main forces of the empires allies came into action on other decisive fronts. The concentration on both sides was to have tactical concepts while no doctrine integrating tactics with operational strategy and national strategy existed to give coherence to the whole business of warfare. 1965 was a failure in resolution at the highest level. Both the president and his handpicked chief lacked the resolution to provide strategic direction to a well oiled machine which had the potential to inflict a severe strategic defeat on the enemy. The job of an army HQ is not just to formulate plans but to effectively supervise the execution of plans. Ayub in words of a British contemporary was devoid of “operational experience” “organizational understanding” and “lacked tactical flair”.3 Thus Ayub and Musa saw no need to have intermediate corps headquarters to over insure the success of the army’s main attack involving a force of an infantry division and an armoured division. This was a case of extreme naivette rather than a minor error of judgement. Probably the supreme commander was too busy with Five Year Plans and big business and had lost sight of the business of soldiering! His handpicked proxy chief wanted a peaceful tenure in which he would not be forced to exercise any strategic judgement! The 12 Divisional organizational failure, one of the main reasons of Grand Slam’s failure, was another glaring case of lack of organizational insight on part of Ayub and Musa. While the Indians had bifurcated their forces in Kashmir based on north and south of Pir Panjal range right from 1948 and early 1950s Pakistan’s military supremos naively thought that one divisional headquarter was sufficient to manage a front of 400 miles in a mountainous territory spanning the Himalayas, Karakorams and the Pir Panjal! At the strategic level both India and Pakistan got an opportunity to knock out the other side. Pakistan got it twice, first at Akhnur and then at Khem Karan. India got it once at Gadgor on 8th September. Both the sides failed. On the Pakistani side the failure had more to do with lack of strategic insight at Akhnur, ordering a change of horses in the middle of a crucial operation. Then at Khem Karan the Pakistani failure was at divisional level i.e failure to pump in all five armoured regiments on the 8th or 9th September thus achieving a decisive breakthrough.The situation was made worse by absence of Corps Headquarter. The Indian failure at Gadgor had more to do with failure at brigade and divisional level in actual execution despite the fact that the Indians had the mains “available” as well as “physically available” to achieve a breakthrough. The failure was Brigadier K.K Singh Commander Indian 1st Armoured Division who saw a threat to his flanks which in reality was a tank squadron of 62 Cavalry which had lost its way and blundered into the Indian artillery echelons opposite Rangre. The Indians had the means to achieve a breakthrough but failed primarily because lack of coup d oeil and resolution at brigade level. This was a command and execution failure. 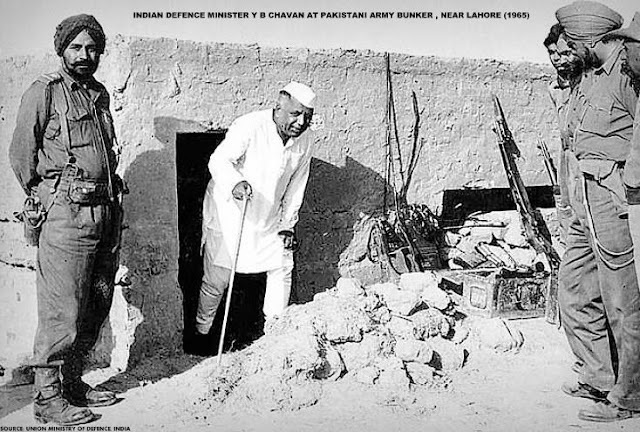 In Khem Karan on the other hand Pakistan had the resources but failed to bring them into the battle area because of poor staff work and planning at divisional level. Thus on the decisive 8th September Pakistan did not have the means to achieve a breakthrough and this had more to do with poor initial planning and staff work at div and brigade level rather than at the command or execution level. Thus the Pakistani failure was a staff and planning failure in which all from brigade till GHQ were included while the Indian failure was a command failure in which the prime culprits were the armoured brigade and divisional commander. On the Pakistani side the success at Gadgor had more to do with outstanding leadership at squadron and unit level rather than any operational brilliance at brigade or divisional level. In the Indian success at Khem Karan, however, an important role was played by Indian higher headquarters at divisional corps and army command level. 1965 was a failure of offence and triumph of defence. Except in Grand Slam where initial overwhelming superiority enabled Pakistan to achieve a breakthrough, on both sides defence triumphed as a way of war. Both the armies were more used to defence because of British colonial military experience and comparative relative lack of difference in weaponry also ensured that defence triumphed over attack. Thus the attackers failed at Gadgor, Chawinda, Assal, Uttar and Valtoha regardless of religion of the defender! Both the armies lacked the dynamism to conduct attack a far more complicated form of war and totally outside the pre-1947 experience of fighting divisional and brigade level defensive battles till overwhelming superiority enabled the Britisher to resume the offensive as at Alalamein and that too with non-Indian formations like the purely British armoured divisions or in Burma where the British-Indians had overwhelming superiority against the Japanese in tanks and air. While Indian GOC Western Command Harbaksh Singh admitted that the Pakistani attack opposite Khem Karan could have been decisive we in Pakistan have twisted 1965 war into a case of blaming the civilians for intriguing against the army and leading it into an aimless military adventure. Even today India’s top military thinker Ravi Rikhye admits that Khem Karan had the potential to be India’s Fourth Battle of Panipat. Pakistan failed because its military leaders lacked the strategic insight which was necessary to transform its tangible qualitative superiority in equipment and manpower at the tactical level into a victory! 1965 was an undoubted strategic failure on part of Pakistani higher command. Pakistan paid the price six years later. Success would have meant unity. Defeat led to civil war and secession. The fault lay in lack of strategic insight at the military level. Major (retd.) A. H. Amin - Tank Corps: 13 Years service in Pakistan Army (PAVO 11 Cavalry,29 Cavalry,58 Cavalry,15 Lancers,5 Independent Tank Squadron,14 Lancers,15 SP) and 31 years research . Ex Editor Globe , Ex Assistant Editor Defence Journal , Ex Editor Journal of Afghanistan Studies. Publications: More than 200 articles in News, Nation , PRAVDA,Pakistan Army Journal , Citadel Magazine of Command and Staff College,Journal of Afghanistan Studies,Indian Strategic Review,Dawn ,Friday Times,Outlook Afghanistan ,Afghanistan Times,Frontier Post,Globe,Defence Journal,Media Monitors Network,Pakistan Army till 1965 held at US Army War College Library,US Army Command and Staff College Library,Indo Pak Wars a Strategic and Operational Analysis,Sepoy Rebellion of 1857-59 Reinterpreted, The Essential Clausewitz,Man’s Role in History: Education/Credentials : Masters (History). Past/Present Clients: Various Think Tanks , Afghanistan Research Associates,Centre for Study of Non State Militant Actors in Afghanistan and Pakistan. Pages-397 and 398-On War-Edited by Anatol Rapport-Reprinted National Book Foundation-1976. Page-93-Memoirs of a Bystander-A Life in Diplomacy-Iqbal Akhund-Oxford University Press-Karachi-1997. Pages 428 & 429-Pakistan-Memories of Earlier Years-Lieut Gen Sir James Wilson-Army Quarterly and Defence Journal-Volume-120-No Four-October 1990. Pages-61,129,135 and 136-War Despatches-Harbaksh Singh-Lancer-1991. Ravi Rikhye’s article on Assal Uttar-ORBAT-19 August 2001. This article was first published at DefenseJournal on September 2001 and All rights are held by the original publisher.